Ever since it was invented, the superheterodyne radio teased the imagination of radio designers in trying to get more and more efficient mixers and with better performance. Soon it was realized that the mixing action not only produced the trigonometric product of the RF signal with that of the local oscillator, and therefore their sum or difference, but also the generation of spurious originated mainly from strong signals in antenna. In the sixties, a talented protagonist in the world of RF mixer design was undoubtedly William K. Squires, chief designer and vice president of Squires-Sanders, Inc. As is known to those who, like me, for many years now hang out in the world of Radio, he designed a switching balanced mixer with an electrostatic beam deflection tube that was used successfully in the SS-1R and SS-IBS receivers of the aforementioned company. In 1967 he designed a two FETs balanced passive mixer with excellent characteristics with regard to the intermodulation and noise figure (Ref.1 and 2), but perhaps little is known, to most people, that he also designed a mixer with a dual triode, with the same principle as the one with the two FET. This mixer was used in the AN/URR-58 receiver for the U.S. Coast Guard. The characteristics of this receiver were and are exceptional (Ref. 3), and this aroused in me curiosity and interest. 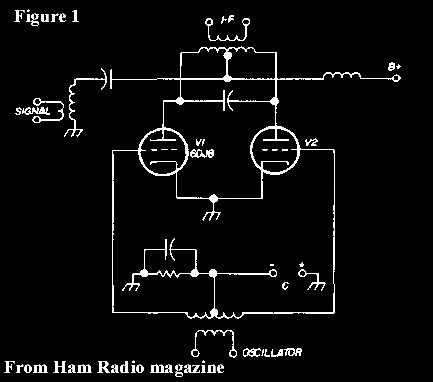 Unfortunately I have not managed yet to get hold of a circuit diagram of the receiver but thanks to a draft of the principle of the mixer circuit, which appeared on Ham Radio 1973 (Fig.1 and Ref.4), I was able to build an experimental version , this in the mid-eighties. The mixer employs a dual triode tube type 6DJ8 (ECC88 equivalent) in a singular balanced configuration. The RF signal is sent to the center tap of the primary of the first intermediate frequency transformer where the two out of phase signals of the local oscillator are, theoretically, canceled. The tube is biased for a Class C operation, this allows it to act as a switch and then to commutate alternately to ground the RF signal through the two cathodes, according to the polarity of the RF voltage generated by the local oscillator. The IF signal is picked up in the intermediate frequency transformer secondary. In the AN/URR-58 this circuit was preceded by a tube RF amplifier stage. The schematic that I have reconstructed is that of Figure 2 where it can be noted that the sinusoidal signal of the LO is sent to the two grids in Push-Pull, via a broadband unbalanced / balanced transformer. The fixed negative Bias voltage is sent to the grids through VR1 which serves to balance it. The circuit can be simplified by eliminating VR1 and a resistor, as well as the four capacitors (see Fig.1). In my case these components were necessary because I used, at first, a Push-Pull tube oscillator. Then I added the broadband transformer, useful not only to have a balanced LO signal with any oscillator (or test generator), but also to raise its level. The tests and assessment measurements brought the results that appear in Table A and as you can see they are excellent! To be noted that in the original Squires version the oscillator has a square waveform and therefore the compression point would be even better! Subsequently I made a simple but substantial change to the circuit, the removal of the B voltage! The FET, as we know, can function as a mixer without any power supply, but here it is a thermionic tube! It is true that in the past tube diodes have been used as mixers (some of a special kind like the double diodes RD12 or LG12) but in the concerned circuit we are dealing with a double triode! In fact we have to do with a tube that functions as a switch (more specifically as a variable resistor) and not as an amplifier. In help are the Bias and the RF local oscillator voltages. The modified version appears in Figure 3 where it can be seen that the intermediate tap of the IF transformer primary (and therefore the tube plates) is brought to ground via the antenna circuit. By varying the Bias voltage change the performance of the mixer, this makes us understand that the tube continues to work as a triode (double). It can be groped to explain the operation of this unusual mixer, and with these particular working conditions, in the following way: the plate being connected to the ground, is at the same polarity as the cathode. The electrons, which always have a negative charge, are expelled from the cathode, which is also of negative polarity. As usual, the grid functions as a flow regulator of the electrons, and hence to their journey toward the plate (or anode), which being negatively charged are attracted by the grid because in this case has a fixed positive bias, and leaves them to pass on their way toward the anode that, however, tends to repel them being of the same negative polarity. When the grid becomes negative (negative half-wave of the oscillator voltage), it is a barrier for the electrons that cannot overcome it in order to reach the plate (which in any case would reject them, being of the same polarity). Electrons flow is forced back to the cathode. Things are reversed again when the grid is back with positive polarity. The fact is that this rhythmic change of state varies the anode current of the tube and thus also its internal resistance, therefore the ends of the primary IF transformer are alternately connected to ground by the two triodes. It is obvious that a circuit of this type can only produce an insertion loss but being a high impedance circuit the raising of the RF signal, thanks to the antenna filter step-up, amply compensates for the loss and results in an excellent sensitivity! The sensitivity in the modified circuit is better than in the original one, probably the absence of the anode voltage, and thus a very low current in the plates, significantly decreased the noise. With a good voltage gain factor of the radiofrequency filter an RF amplifier stage is almost superfluous. Differences in performance between the two circuits, the one with B power and that without are evident by comparing the results in Table A and Table B. Therefore we have an excellent mixer, with a dual-triode tube, that has been modified in a passive mixer with superior performance. But....if we also remove the fixed positive grid voltage, what happens? It continues to work but there is an increase in the insertion loss of 2dB which then takes from 4 to about 6 dB total. The RF local oscillator voltage is sufficient to operate the tube! What? If we remove also the voltage to the filaments?! No, this is not possible! !